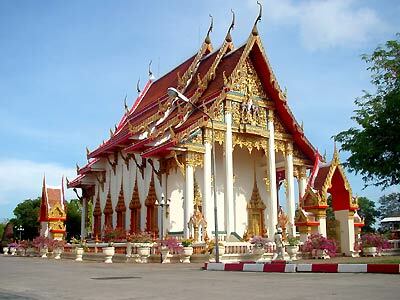 The Chalong Temple ( Wat Chalong) is one of the most venerated in Southern Thailand and in particular in Phuket. Some sculptures of the former abbots are in a very beautiful adjacent teak building with rich carvings, especially the doors, many come to pray in front of the sculptures. Wat Chalong is associated with the revered monks, Luang Pho Chaem and Luang Pho Chuang, both of whom were famous for there work in herbal medicine and tending to the injured.